Tasmania’s Indigenous History May Shock You. I’ve written many times about how we fell in love with Tasmania, but perhaps one thing I haven’t spoken enough about, is the Indigenous history of Australia’s island state. There’s a reason for that; during our 3 months in Tasmania, although we learned a lot of history, I’m sad to say we didn’t learn much about Tasmania’s first peoples. There were snippets on a couple of signs, and a small amount I managed to track down at Port Arthur, but sadly I don’t feel there’s enough information in general tourist areas. 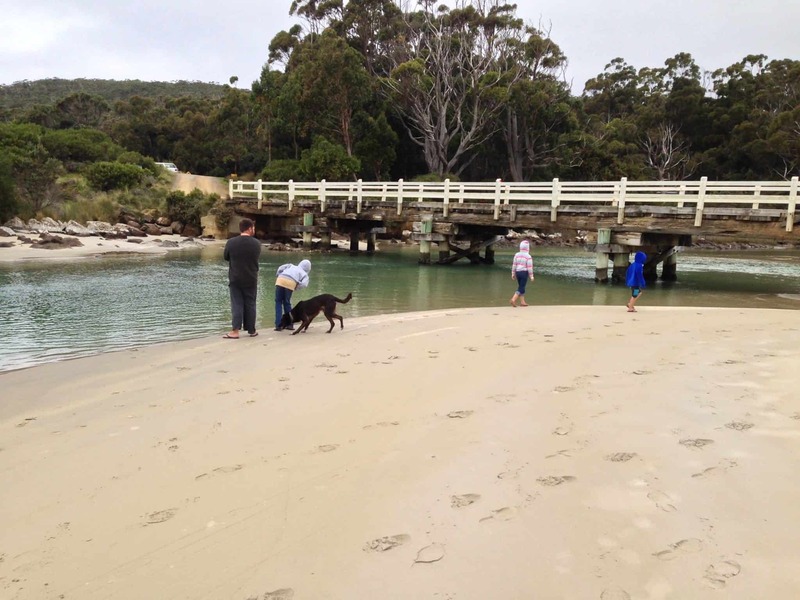 There may be more accessible information on Flinders Island, Bruny Island or Maria Island but we didn’t make it to any of those, so perhaps that’s why we didn’t see more? As someone majoring in Indigenous Studies, and because I wasn’t satisfied with what I learned, I’ll tell you what I know myself, and I hope, if you visit, you’ll track down something wonderful and send me information. I do intend to re-visit Tassie and track down more for myself. I set off on our adventure keen to uncover how settlement may have affected Indigenous peoples in Tasmania, who before settlement knew the island as lutruwita (lu-tru-wee-tah). In 1803 settlers arrived to form Australia’s second British colony at Risdon Cove, and it was named Van Diemen’s Land as part of the New South Wales settlement. In 1856 the island was granted self-government and the name officially changed to Tasmania. Of course, I realised that just like every part of Australia, settlement was likely a destructive time for Indigenous populations, but how destructive? What happened? Did any clans survive on their own lands? What was the initial reaction from either side? Unfortunately, the story isn’t a kind one. 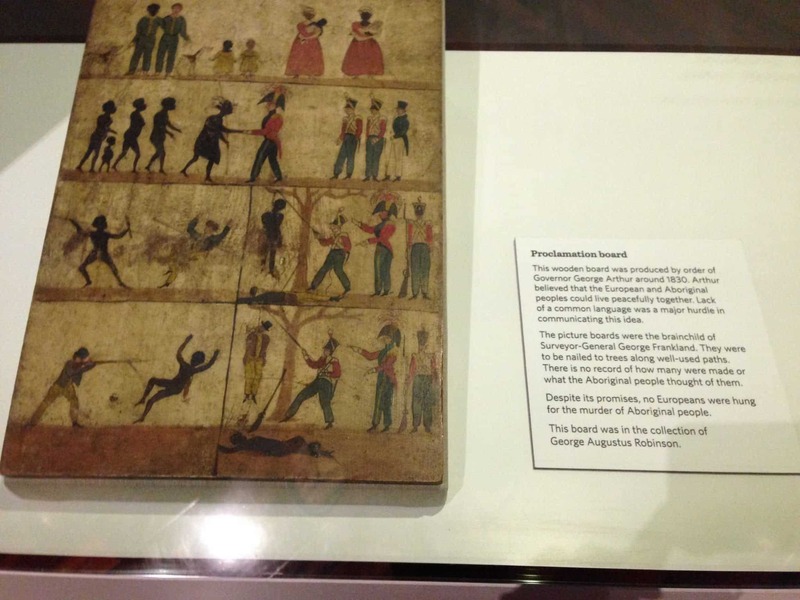 Before settlement it is believed there were nine Indigenous Nations living on Tasmania, who traded with European sealers with very little animosity, but once settlement began, Indigenous peoples were pushed off their lands in order for settlers and convicts establish colonies and farmland. Land would be fenced off and distributed for farming and cropping, but when Indigenous peoples rely on their homelands for food and water, to fence this off means desperation and lack of ability to survive. If you’d been living peacefully on lands for no less than 35,000 years and all of a sudden found your lands fenced off resulting in your family starving, what would you do? Of course you would need to fight, you would be driven to fight; fight for the right to eat, and stay alive. Most people don’t understand that for the most part, Indigenous Australians were not historically a nomadic peoples, instead they existed in designated lands which they cared for and used to sustain all they needed, sometimes trading with neighbouring Nations for tools or foods they may not have access to on their own Country. So it was not as simple as being kicked off one area of land by settlers and moving on to somewhere else, Indigenous peoples could not just take over someone elses lands. Sadly this is the theme right across Australia, not just Tasmania, but on an Island state so small, losing lands would have had horrific consequences. Lieutenant-Governor Arthur declared martial law in 1828 resulting in Aboriginal clans being forced out of areas and away from white settlers, murdered or incarcerated. Those who were not forced out were decimated by European diseases which killed many Indigenous peoples who had no immunity to such health issues. 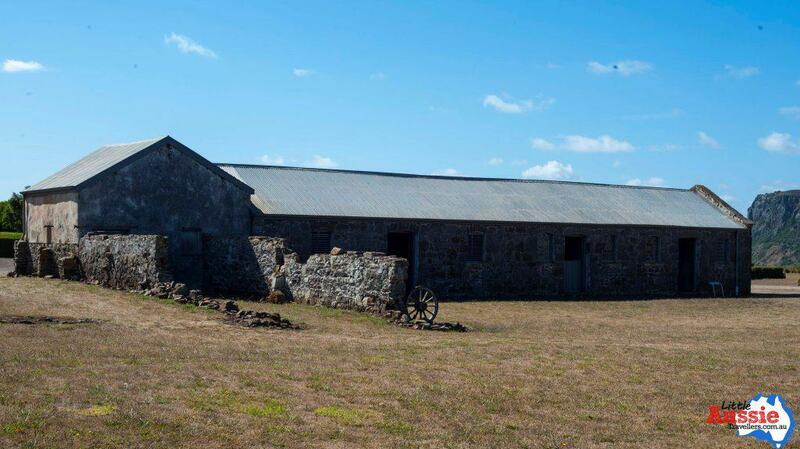 Surviving Indigenous Tasmanian peoples were forced onto Bruny Island, Flinders Island, and other areas, where most died due to poor conditions and disease, before a settlement at Oyster Cove was formed and those who survived were mostly left to their own devices there. There is, today a Tasmanian Indigenous population who have worked hard to revive and continue Indigenous language and connection to land and culture, so as proven right across Australia, our First Peoples are resilient and determined and this should be celebrated. My Most Treasured Indigenous Insight While In Tasmania. One area we did visit that holds Indigenous significance is Recherche Bay. Many people would have heard of Truganini (1812-1876), a brave and amazing Aboriginal woman who survived the destruction and decimation of her peoples, caused by white settlement. Truganini was born in Recherche Bay, daughter of the leader of the region. While much of Truganini’s family were brutally killed, Truganini travelled with her partner Woorraddy who accompanied George Robinson, serving as a guide and interpreter, during attempts to relocate Indigenous populations to several island settlements. During this time, Truganini became disollusioned with Robinson’s mission, realising that his attempt to remove and relocate Aboriginal peoples would all but remove the chance for traditional Indigenous life in Tasmania, and instead urged her peoples to stay and with them settled at Oyster Cove. Truganini passed away in 1876, and is believed to have been the last surviving full-blood Tasmanian Aboriginal person. While fighting occured when her remains were recovered from the Hobart Female Factory site in 1878 after much protest and fighting, in 1976 her ashes were scattered on the D’Entrecasteaux Channel, fulfilling her wishes almost one hundred years after her death. I, stood, one small person looking out the the D’Entrecasteaux Channel, and Recherche Bay, and with my standing, felt the gravity of settlement, the pain of a peoples who did not ask for us to be here, and the pain of one woman who fought for survival for herself and her peoples. In all this sadness I felt a renewed hope that as a country we can move forward. We can never undo what has been done during the devastation caused by settlement, but we can be mindful and reflection and acknowledge that while we have grown into an amazing country, this has not been without loss and pain. Together, as a united country we must not lose sight of the most important part of this country. The land. It has nurtured a culture now considered the oldest continuing living culture in the world, and we must care for the land so it continues to nurture the people who now call it home. Do you have an interest in Indigenous History or special memories of Tasmania? Share below. One of the wonderful things about being on the road, is never quite knowing where you’ll be on your birthday. For me, we ended up being in the West of Tasmania, meaning there was lots of amazing nature just waiting on our doorstep waiting to be discovered. 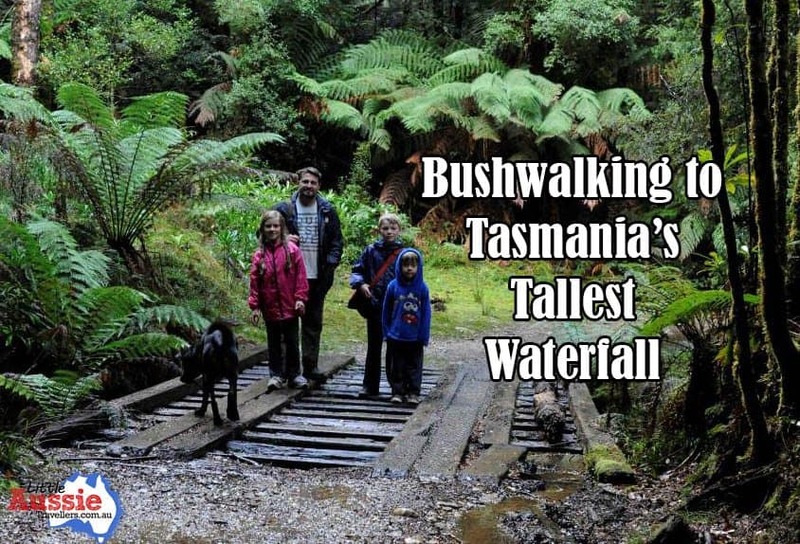 The goal then became to walk to one of Tasmania’s tallest waterfalls: Montezuma Falls. 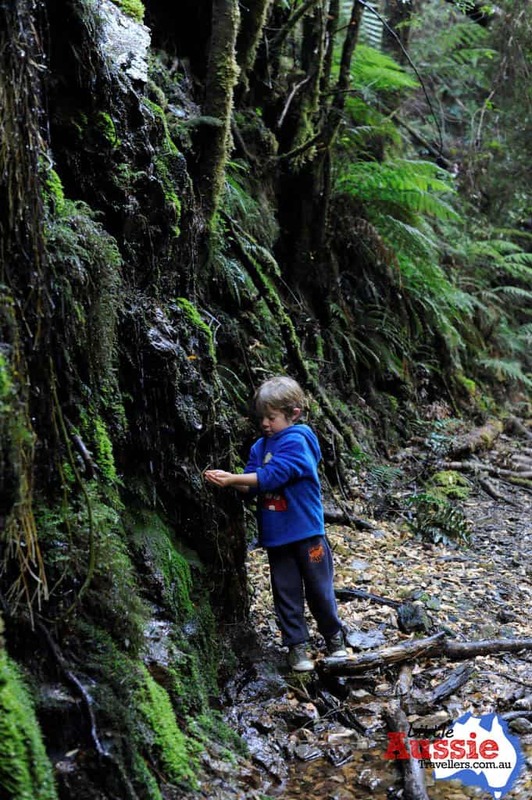 There’s so many options for family bushwalking in Tasmania, but Montezuma was extra special. 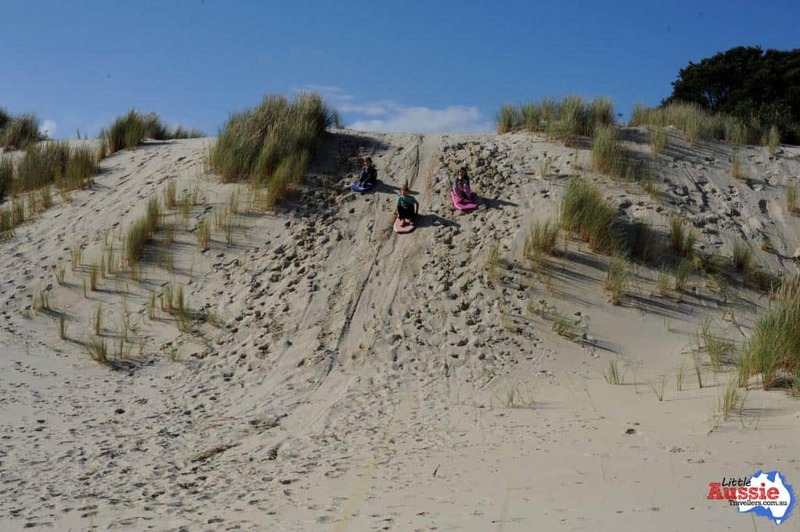 We’d been camping at Henty Sand Dunes, not too far from Strahan, and had lovely weather for most of the time, but as the rain set in for a few days it made it more and more difficult for the kids to enjoy the dunes, so moving to a new site seemed like the perfect thing to do when the rain broke the day before my birthday. We spent the night in an overnight free camp near Rosebery called Stitt Park, which provided a safe, clean place to park the van on a rainy night so we would be close to Montezuma Falls for the morning. You’ll find it on Wikicamps which is what we use to find our free camps. After a rainy morning, the skies pulled back their grey clouds to reveal the stunning blue we’d known for most of our time in Tassie, and so we set off for the walk hoping the drizzle would hold off for the afternoon, and it didn’t disappoint. The road to Montezuma is slightly windy, nothing too bad, and we took the van with us, although if you have a large van, it would be better to leave it where you are camping, and not try to tow it into the car park. There’s room to turn around but it could be difficult if there were too many cars. 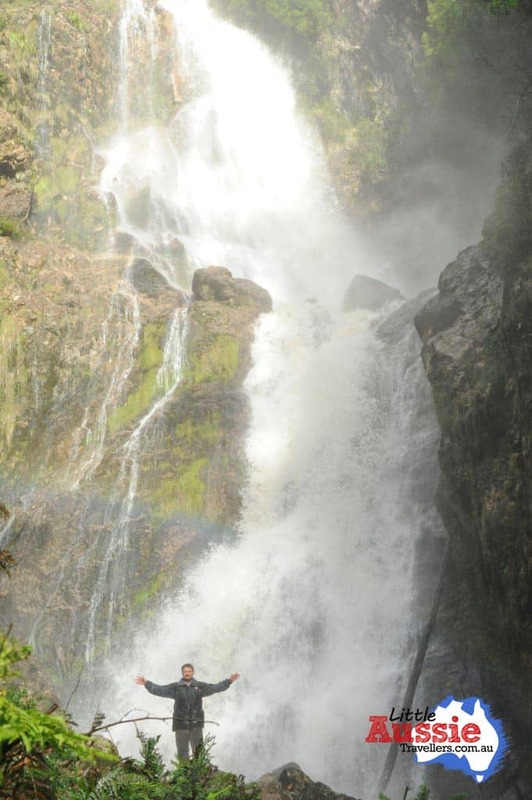 Is Montezuma Falls Worth the Walk? 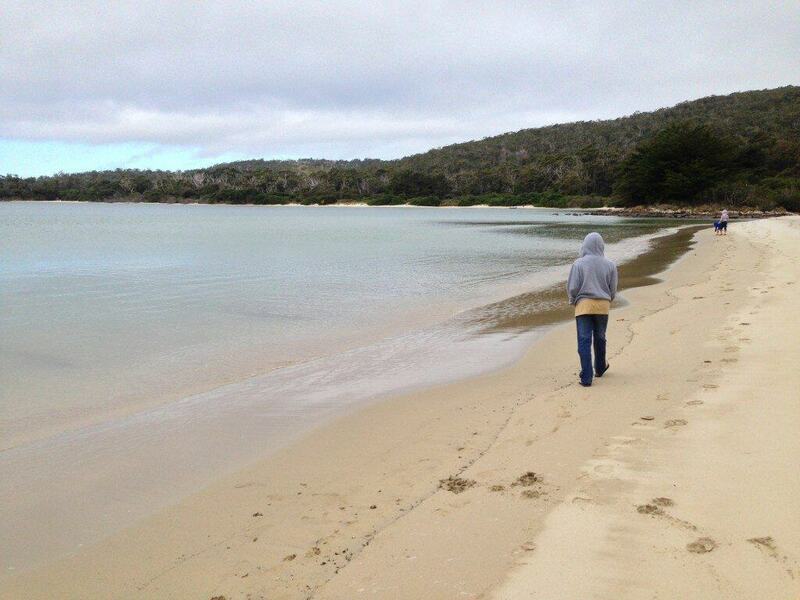 I can honestly say, that the walk to Montezuma and back was one of the best Tasmanian walks that we did. It is also one of the longest treks we undertook in Tasmania at a total of 9.6kms return, but it rewarded us with amazing scenery, and a spectacular waterfall. The entire area was wet thanks to the few days of rainfall that had occurred before we’d arrived, and the morning of drizzle. This meant that the walking track was wet underfoot, and while we began by trying to dodge the puddles, it soon became apparent it was best just to go with the flow, deal with getting wet and muddy and just immerse ourselves fully into the experience. How Difficult is the Walk to Montezuma Falls? The walk to Montezuma Falls is graded as easy and level. It follows the route of an historic light tramway that was built by hand, and you’ll walk right over the top of sleepers that have been laying in place ever since. If you’re there on a day like we were, gumboots would be a great option! During your walk you’ll come across amazing flora, beautiful trees, mosses, interesting fungi, and the sound of water streaming for most of your time taking in the scenery. It is easy to feel as though you’re in the middle of nowhere here, and you really are reasonable secluded, although despite the weather we shared the track with a few other adventurers on the way. The entire walk took around 3 hours, and we walked at a reasonably steady pace during that time, mostly because we didn’t start until about 2pm in the afternoon and we wanted to make sure we were back at the start by night fall, as we had to get to our next camp. As we got closer to the falls, we could hear them in the distance and after an hour of walking in the wet, everyone was pretty excited by reaching our goal. 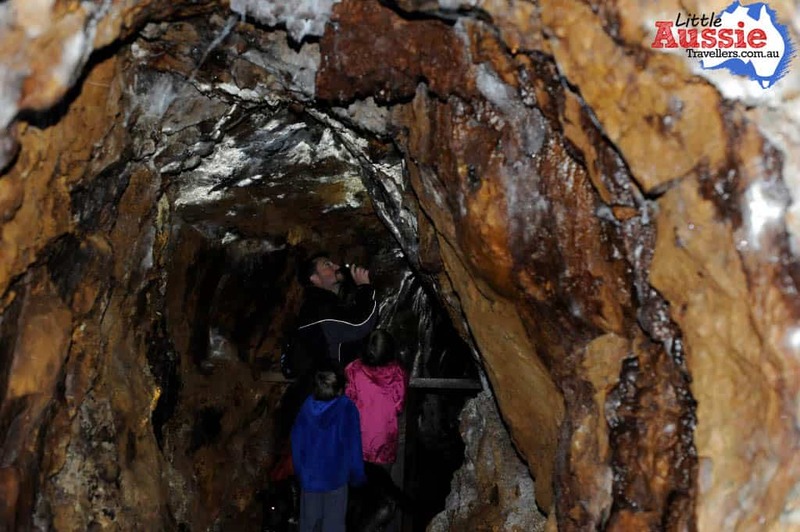 It was a nice surprise to come across an old mine shaft, which told of some of the mining of the region. The West of Tasmania has always been rich with mining operations and discoveries, but as we stood there in the damp, the mine shaft full of water under the walkway, I wondered how people survived the cold conditions in days gone by, especially as they had to forge their way through the landscape to create the very paths we were walking on. 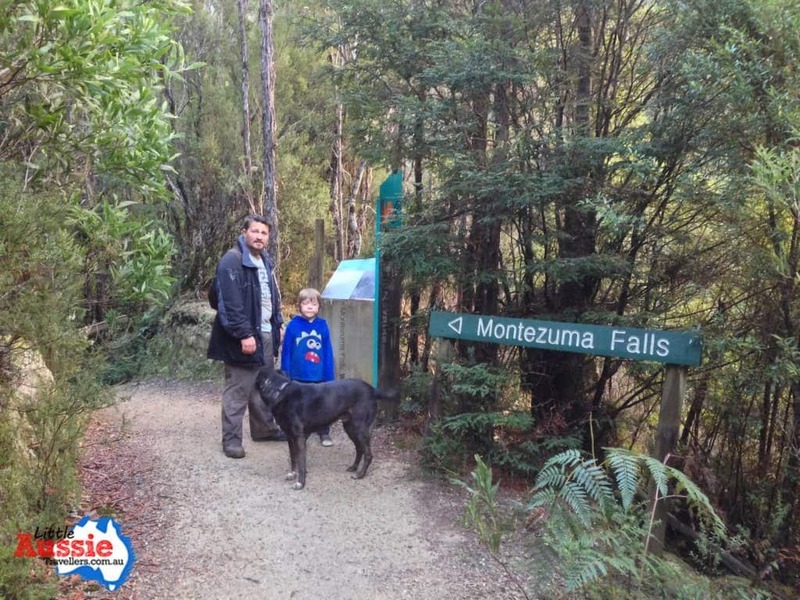 Is Montezuma Falls Walk Dog Friendly? Please ignore their not-so excited expressions 😉 They desperately wanted to explore, not smile for a picture! 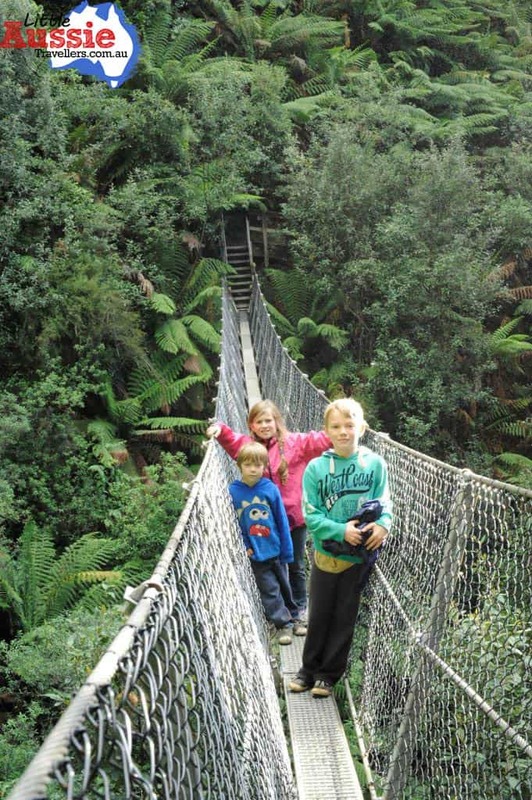 The one thing we hadn’t realised was that Yoshi would follow wherever the kids went, and so off he went right across the suspension bridge! I can only imagine what must go through a dog’s head when they realise they are standing, propped high above rushing water and a very large drop to the bottom. He was super brave and just focused on staying with his people, and it wasn’t until we coaxed him back that he got the wobbles up! I do have a video which I’ll share, but the best option was for Matt to pick the poor boy up and carry him back. Not an experience I think Yoshi wants to repeat, although it was impossible for him to fall, of course as a dog, he wouldn’t quite realise that, so he was a very, very brave boy! 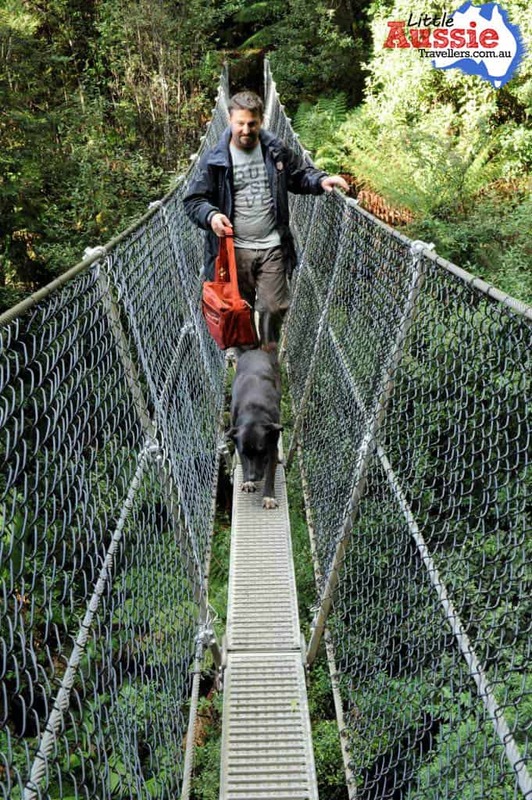 So, after we explored the suspension bridge, rescued the dog from his over enthusiastic adventure session, then it was time to walk up to the platform at the base of the falls. 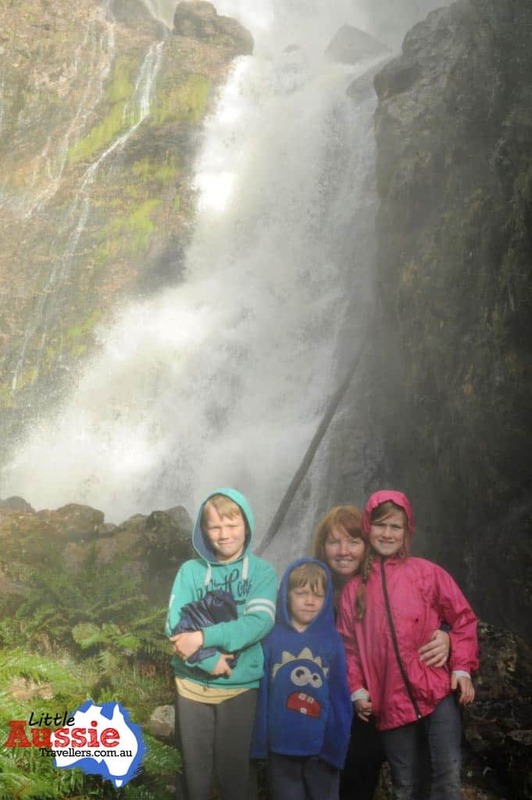 The strength of the water, the height of the falls, and the amazing scenery allow you to just stop, pause and breathe in the freshness and beauty that is the Tasmanian wilderness! 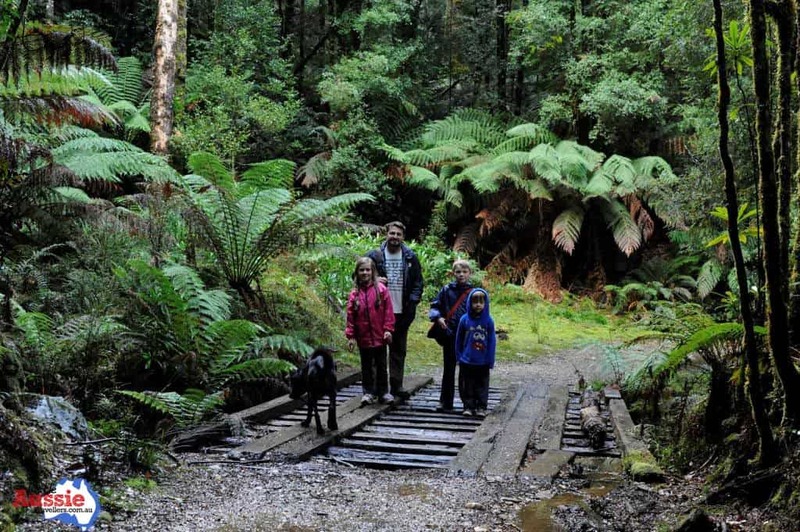 So, if you find yourself exploring Tasmania with kids, then we highly recommend the walk to Montezuma Falls. 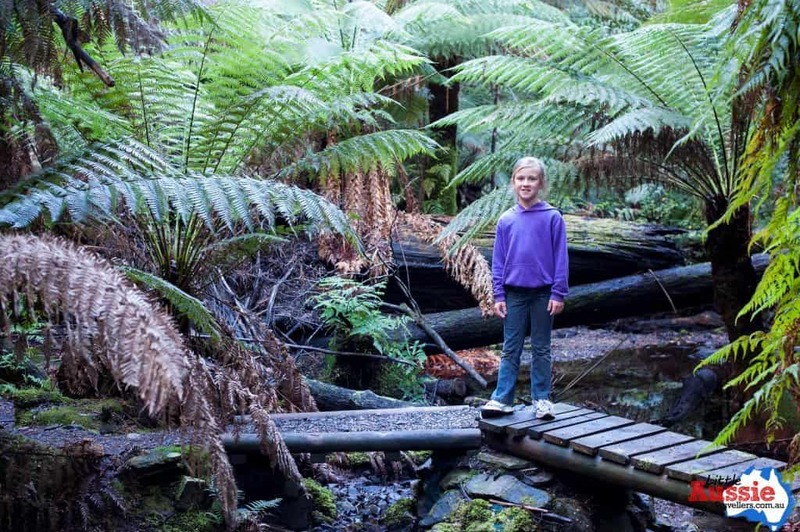 It might be a little challenging for really small legs, but for kids used to walking and happy to experience nature and go on a little bit of an adventure, then it’s a must-see in Tassie. If the weather has been wet, expect the walk to be wet underfoot, so you’ll be soggy if you don’t have gumboots or waterproof shoes. Allow plenty of time. We did it in 3 hours which is the stated time on the sign, although I would have preferred to do the walk a bit more slowly so would have happily extended that amount of time, so leave earlier than we did (2pm) so you don’t have to worry about nightfall. Goodbye Tassie. Thank You Spirit of Tasmania. When I think back to late 2013, we knew we were heading off on our big lap of Australia, but we didn’t really have any idea where that journey would take us, or just where we’d aim for first. 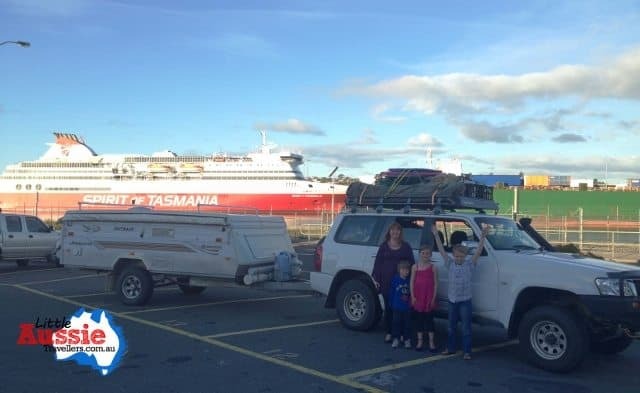 So it goes without saying that when we had the chance to head off with the kids on Spirit of Tasmania, along with the dog, and the caravan we figured why not! Waaaayyyyyy back in February we blogged about our excitement of the journey over there, and how much we were looking forward to a month in Tassie, but it didn’t take long, perhaps maybe three days, for us to fall in love and extend our trip out to a whole three month experience. There’s so much to catch up on! 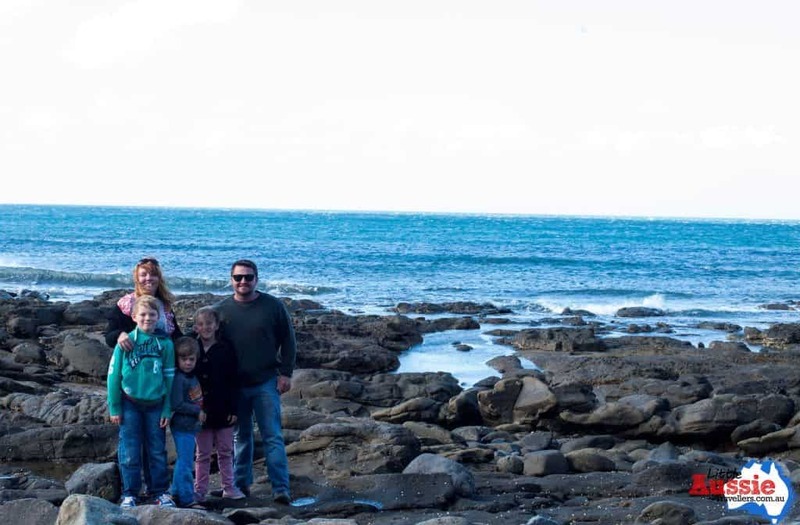 I’ll put my hand up now and admit that we were so busy getting out and exploring Tasmania with the kids, that blogging had to take a back seat. It wasn’t helpful that overcast days challenged our solar and the ability to charge the laptops, or that Tassie doesn’t always have the best mobile internet reception, but if you’ve been there, or if you’re planning to go, you’ll understand why, and you really won’t mind one bit, because the internet and phone mean so little when you get views like this! Alas, here we are spending our final night in a free camp at Forth. It’s only about 15kms from the Spirit of Tasmania terminal in Devonport, so it was a super convenient camp for the night. Our Return Journey on Spirit of Tasmania. Something a little exciting was the fact that our depart date fell on Mother’s Day. So it started with me getting to open my swag of goodies that Matt and the kids had collected right under my nose without me realising! (It can get tricky to buy gifts when we’re all together every day), before we caught up with other travellers we’d met at another camp, who dropped in to say goodbye. 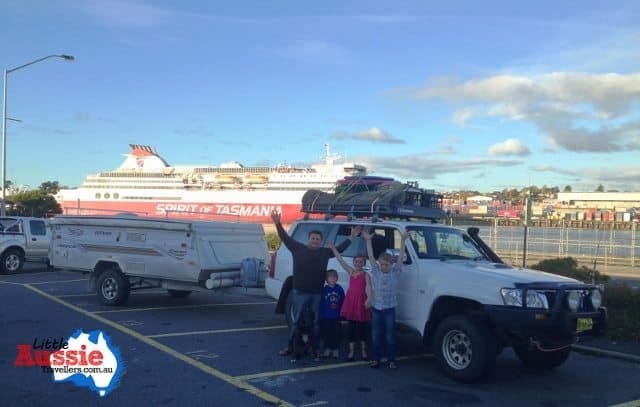 I was sad to be waving goodbye to our home state of three months, but between you and me, having someone else cook dinner for me, a bed that wasn’t in the van, and catching a movie with the kids on board Spirit of Tasmania was exciting me! We checked our gas bottles into the holding area, and before long, it was time time to board, there’s always excitement as we head up the ramp…. We had dinner at The Captain’s Table, which is a buffet style eatery, which the kid’s loved because they got to choose what they had to eat for dinner. A nice mix of roast, fish, butter chicken was a favourite, and the big winner of the night was the dessert and soft drink. Here’s to not having to cook on Mother’s Day and having a beautiful meal with the family! We were pretty lucky that Muppets Most Wanted was playing for the 8pm viewing and we hadn’t seen that before, so the kids were really excited, had full bellies and we enjoyed kicking back and enjoying the Muppet antics together. We also managed to track down the games room which will keep the kids occupied if they are into video games. So now we’ve been to Tassie, would we recommend it? I just can’t tell you how much you SHOULD GO TO TASMANIA!!! Just book your spot on the Spirit of Tasmania and go folks! 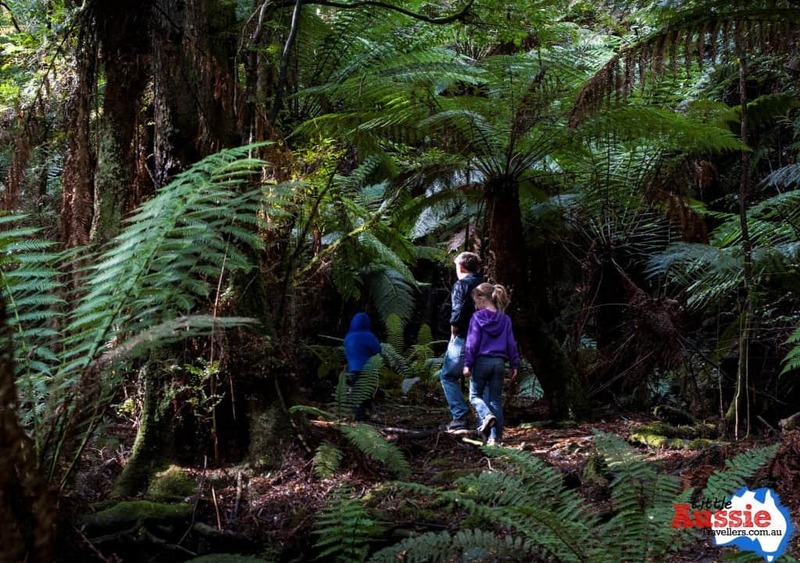 If you even remotely like nature, then Tassie will thrill you with things to see and places to explore. The people are friendly, and the entire State feels like one comfy country town where Mates help each other out and people care about their neighbour. It’s no surprise that lots of people visit on holidays and end up back there to live. Go, Go, Go! If you have a caravan, take it with you. 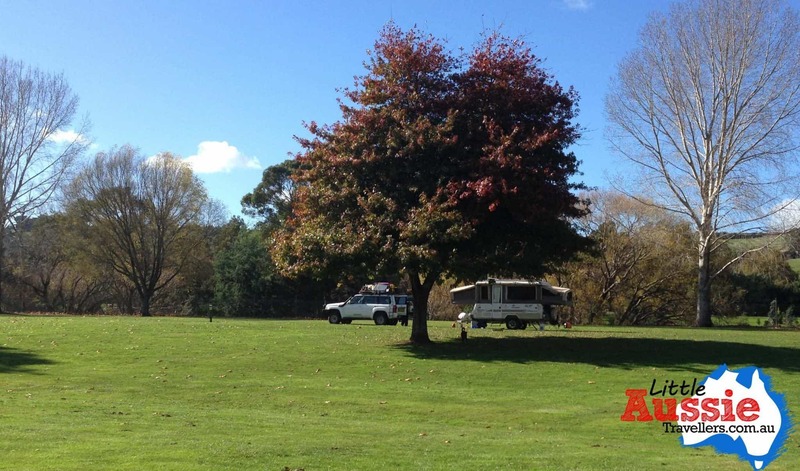 It’s really easy driving on, and straight off again, and Tassie is jam packed with free camp and low cost camping options. If you want to take the dog, then do that too! You’ll just need to make sure their vaccinations are up to date, most importantly they must have had their hydatid tape work tablets within 14 days of departure so keep your receipt and your worming box or get your vet to do it and fill out a vaccination card. If Tassie greeted us with an amazing sunrise as we departed into Devonport on the way over, then Melbourne sure did a great job of giving us a beautiful welcome too…. Just do it, you’ll never regret it! How long should you spend there? Definitely no less than 4 weeks if you can, and we think 3 months was a really nice amount of time, so immerse yourself and enjoy. An offer like that isn’t one to be missed, so we were greeted by Kaye at the Arthur River Reflections Cruise office half an hour before our departure. Once we got to chatting, I was so glad we’d taken the time to drop in, as it soon became obvious what an amazing couple Rob and Kaye are. To say Rob is passionate would be a true disservice to him; he’s beyond passionate, having dedicated a large portion of his life to building his business in Arthur River, Tasmania. 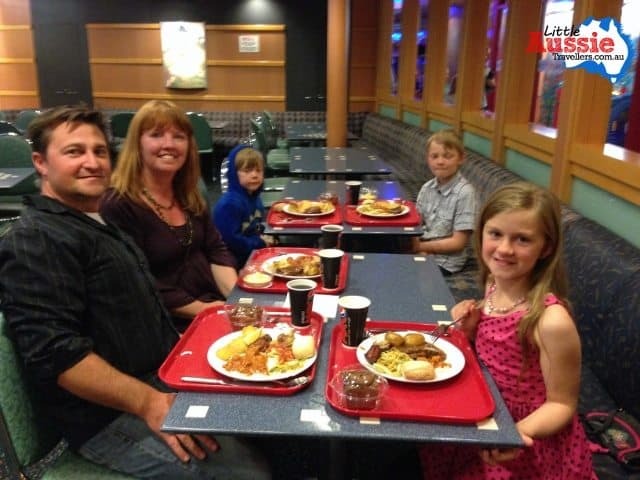 Rob’s cruise business wasn’t just a quick and easy thing to create, indeed, the accommodation section of the business came first, but that wasn’t easy either. When Rob first set about creating a tourism venture in his community, there was not yet power to the southern side of the Arthur River, where his block of land was located. This didn’t stop him, and when council advised they couldn’t supply power until there was a commercial venture in place, he set about building that venture with generator power and hand tools. That business is now the Arthur River accommodation operated with pride by this lovely couple. Rob’s tour boat also didn’t start its life as a tour boat. Nope, after carefully selecting a tri-hull fishing boat, designed for its stability he set about renovating it and transforming it into a multi-level tour boat, so he could provide an amazing river cruise experience to his passengers. 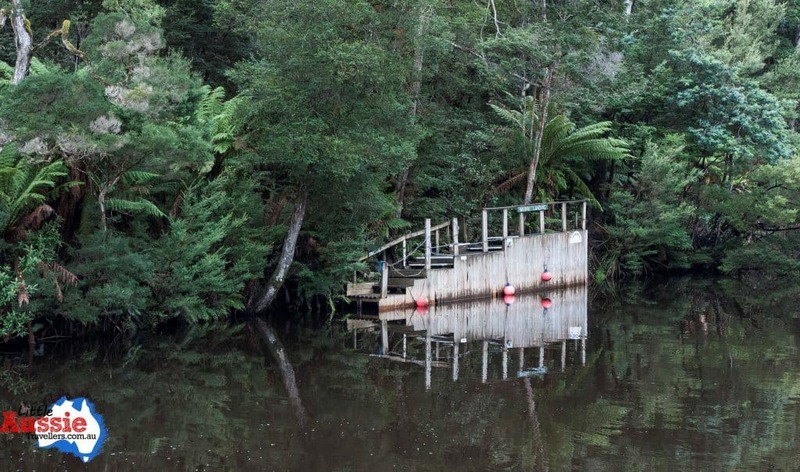 It doesn’t stop there; Rob also built his own landing jetty, rainforest walk and undercover area to host lunch for his guests. Rob’s character and passion help to make the cruise a very special experience when you realise dedication that the owner has put into creating it. 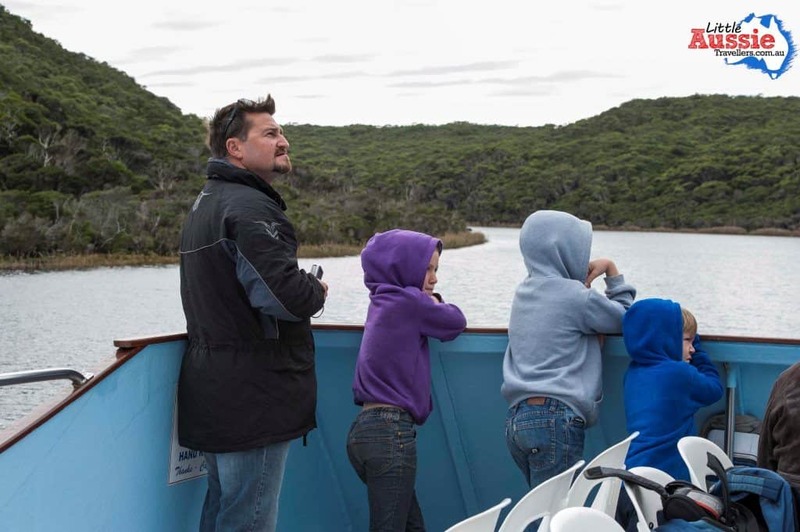 Rob’s local knowledge is built through living many years in the area, and a true love for the wilderness and the wildlife of the Tarkine Region. 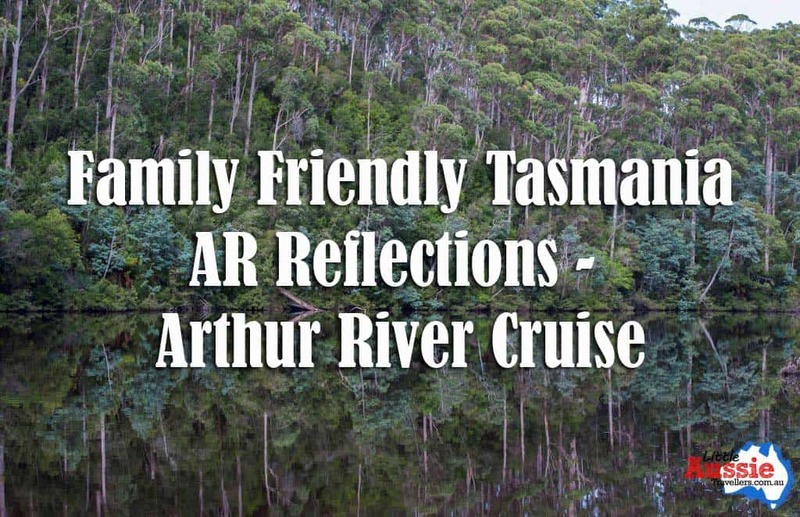 AR Reflections Family Friendly Tasmanian Cruise. 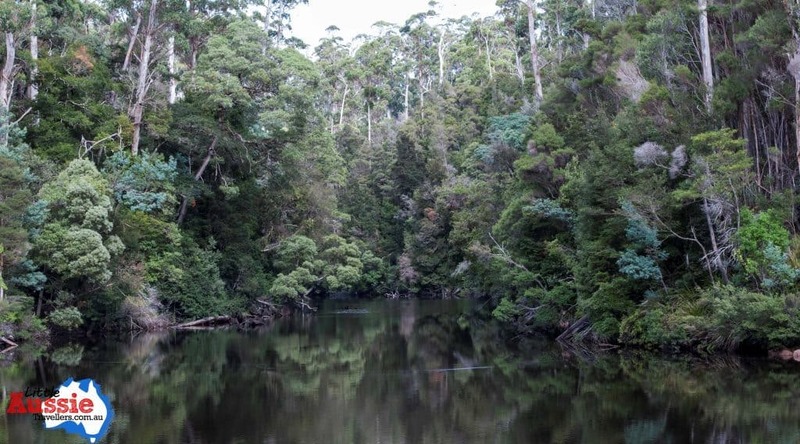 The magic of the Tarkine Region is already weaving its way into our souls as we board the M.V. Reflections. 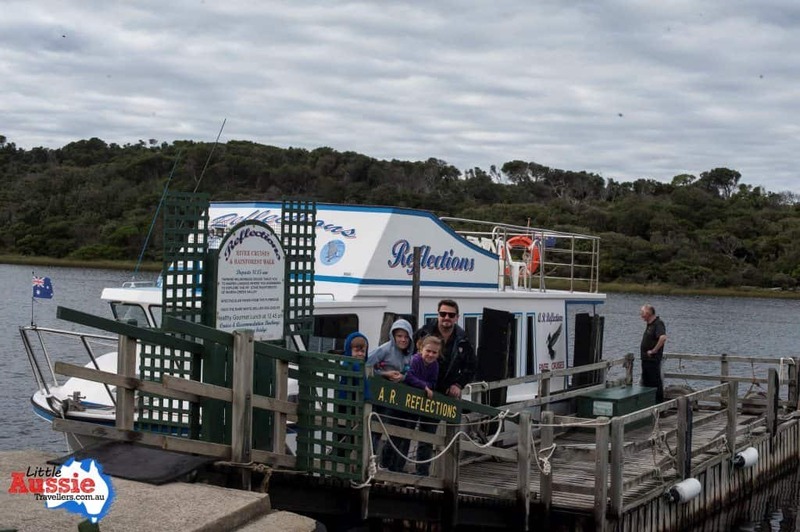 The tour boat sits on the quiet shore of the Arthur River with the ocean beating it’s rough waves to the right, a distinct contradiction to the peaceful river waters. The mouth of the river opens to the ocean at times, and when the rain comes, the waters come with it, dragging fallen and uprooted trees to their resting place on the beach shoreline. “It gets a whole lot rougher than that, it’s a quiet day today” Rob tells us he steers the boat in the direction of the ocean, taking us for a closer look before turning the boat around and heading for our peaceful journey up the Arthur River. The kids are excited, and after a safety run down they are allowed to head to the top deck of the boat for the perfect view. It’s quite amazing how much the scenery can change during a 15 kilometre cruise. The river’s edge is lined with beautiful trees and vegetation, although Rob’s local knowledge let’s us in on the secrets of the types of trees, bird life and little stories about tornadoes and other natural events that have occurred over the years. As we meander along the Arthur River for the next 15 kilometres, the stillness and beauty leaves you with little choice but to relax, and settle into the soothing spirit of our gorgeous surrounds. 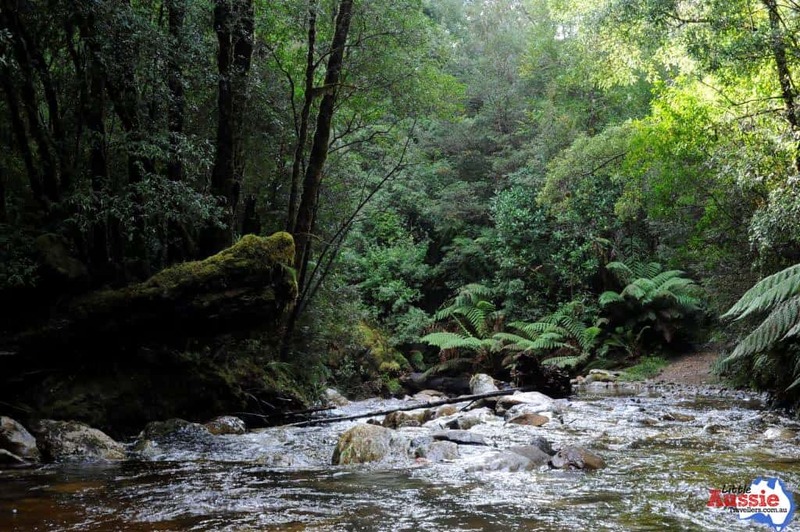 We travel to the fork of the Arthur and Frankland rivers, before returning to undertake Rob’s exclusive lunch and rain forest walk to Warra Falls. The entire jetty, undercover lunch area and walk were created with Rob’s own hard work, this man is something special for sure! 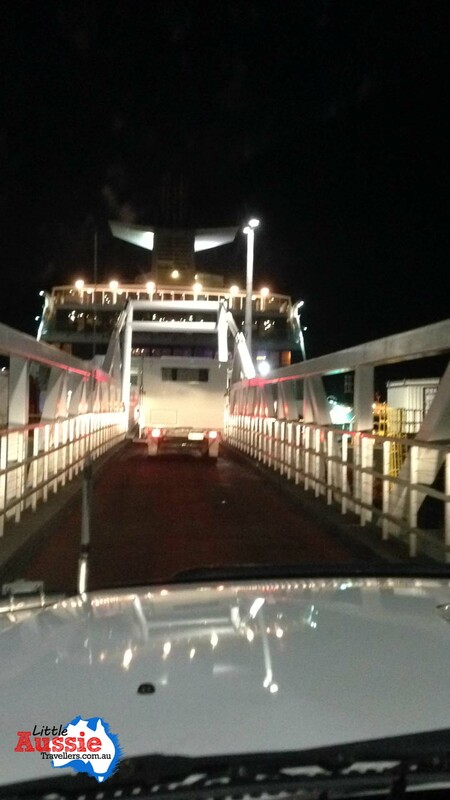 We disembark M.V. Reflections and are treated to a beautiful lunch. Wine, soft drink, a range of fruits, cheeses, sandwiches and beautiful home baked sweets. There’s a happy banter among our fellow passengers and we’re all swept away by the tranquility of our surrounds. Special guests for lunch were several extremely cute Tasmanian Pademelons, Rob packs them their own special lunch so they don’t miss out when he visits. 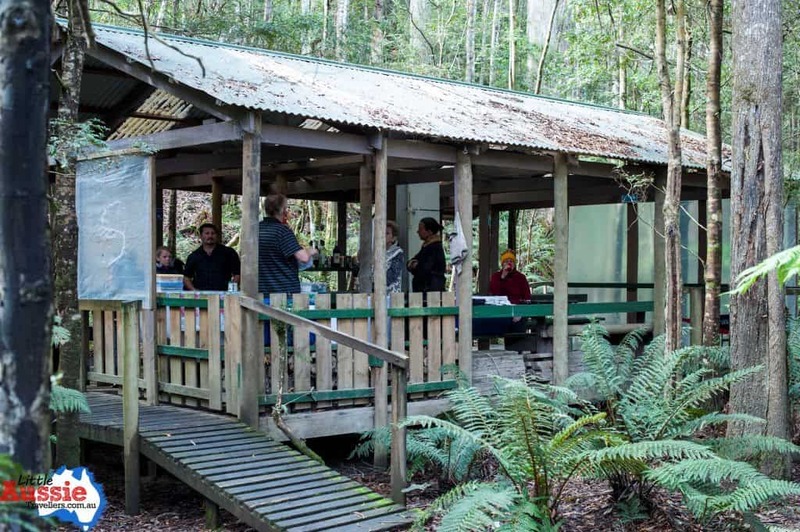 The excitement and learning opportunities of the day don’t end there, after lunch and refreshments, it’s time for the rainforest walk which, again, is enhanced by Rob’s passion in sharing what he knows and loves of Tasmania. We carry albums each filled with photos, information and numbers which align with numbers Rob has placed along the walk. 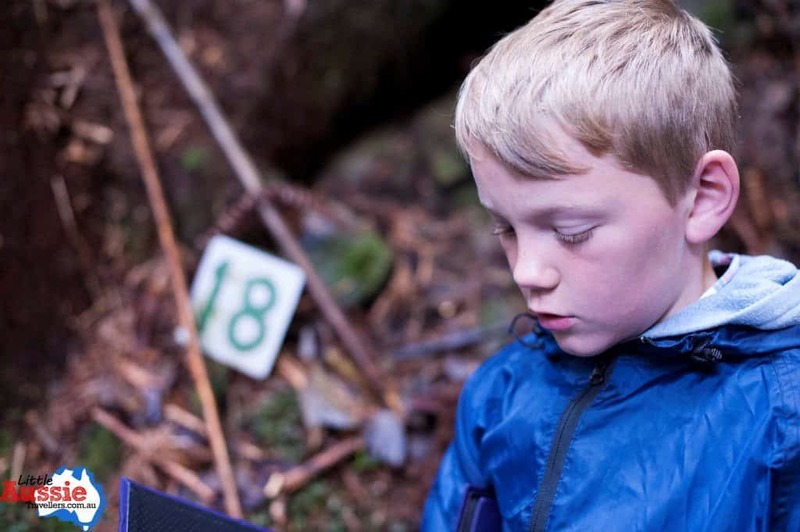 This allows us to take part in a self-paced walk while learning and discovering the amazing Tasmanian Tarkine Region. 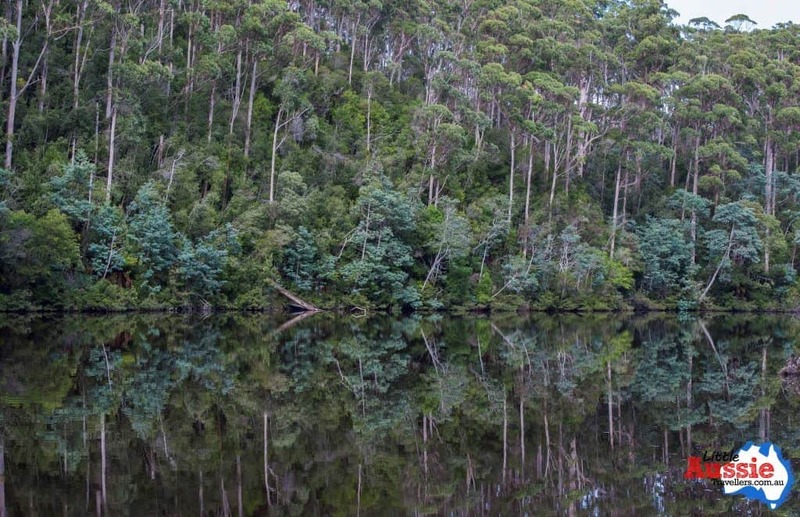 The return trip is just as beautifully relaxing and gives you an opportunity to grab some more amazing photos, especially when the wind is quiet, and the reflections provide double the beauty of the stunning Tarkine. You can definitely see why this is the Arthur River Reflections cruise! One of the greatest joys of this slow, peaceful, breathtaking journey on the waters of the Arthur River is the fun you’ll be a part of with the resident Sea Eagles who have made the region their home. Rob gives them a treat of fish and in return they provide an amazing view as they swoop quickly into the water and carry away their treat. 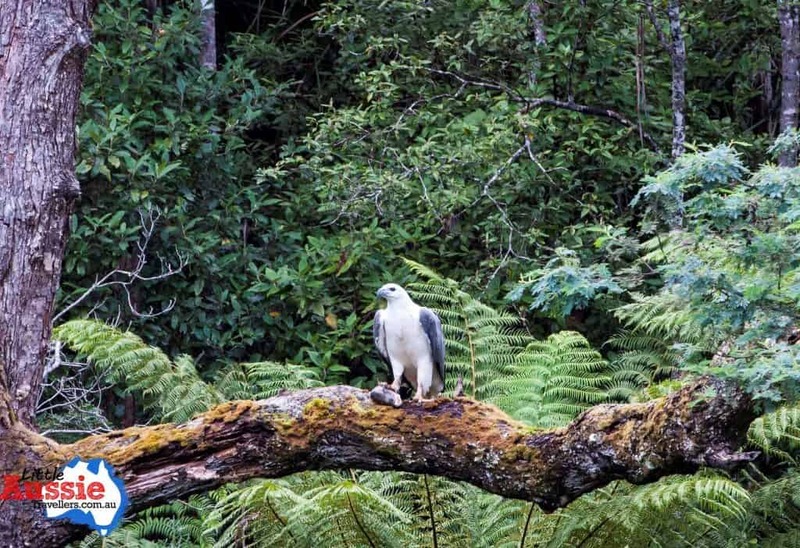 I love this photo, and if you look at the foot of the eagle, you’ll see it’s fishy reward held safely, waiting for us to continue our journey so it can eat in peace. The nests we saw were huge, and we even spotted a baby sitting up in the trees being watched over by it’s Dad! 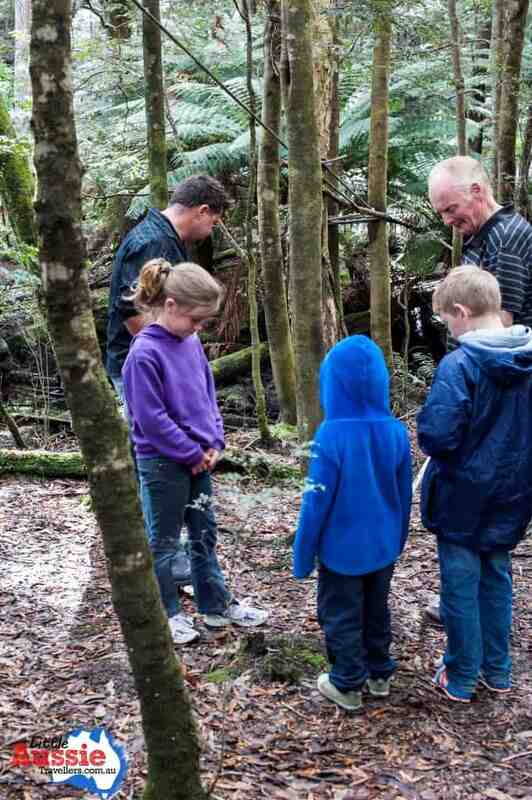 So if you’re looking for things to do in Tasmania with kids, then Arthur River Cruises by AR Reflections offer the perfect chance for the kids to see some beautiful wildlife and discover the untouched wilderness that is Tasmania’s Tarkine. 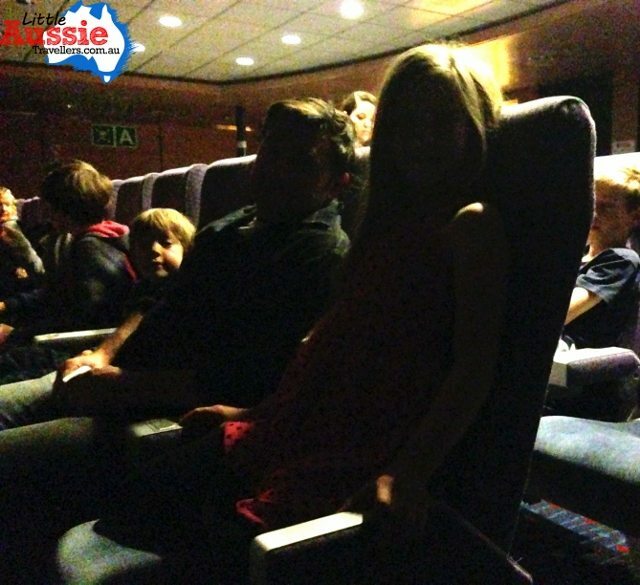 The entire experience lasts around 5-6 hours, so our advice would be to pack a drink and snacks for the boat, and for really young children take some toys or activities. ANZAC Day services make me sad. They bring tears to my eyes and I feel pain for all the families who have suffered heartache at the hands of war. Regardless of my own sadness, we make a point of attending each year, as a family. We feel it’s important for our children to understand the history of our country and there’s no dodging that war has been a part of that history, and is still a part of life for many Australian families today. 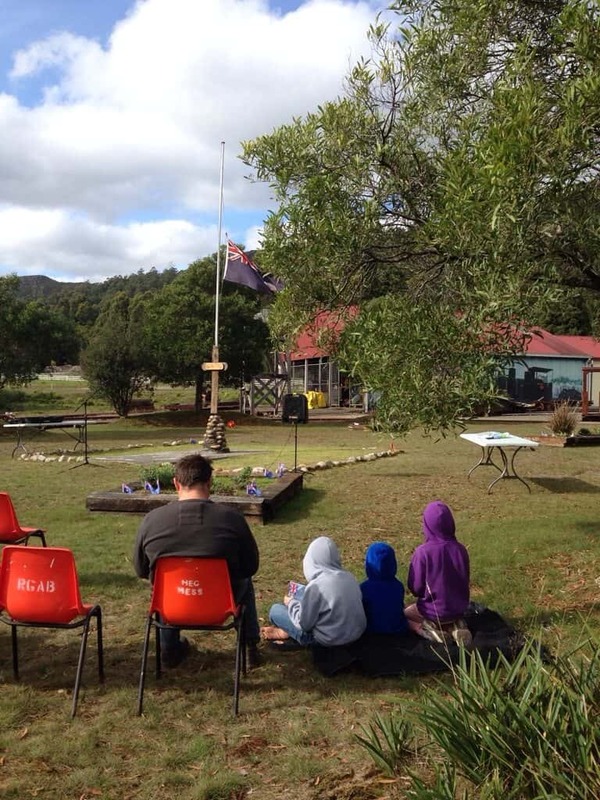 We are staying near Tullah in the West of Tasmania at the moment, so we took the time to attend the ANZAC Day service in this small community today. It was their first ever ANZAC march, and they were so glad to have been awarded a grant to finally erect a cenotaph in memory of their fallen which will be in place for next year’s service, so it was a lovely experience to be part of. To all the men and women who have served or are still serving for our country, thank you. To all those families who suffered loss, we are grateful for the freedoms afforded us by your loved ones. If it wasn’t the sunrise that first stole our hearts as we arrived in Tasmania, or the friendly people we met on our first busy day here, then it was Stanley. 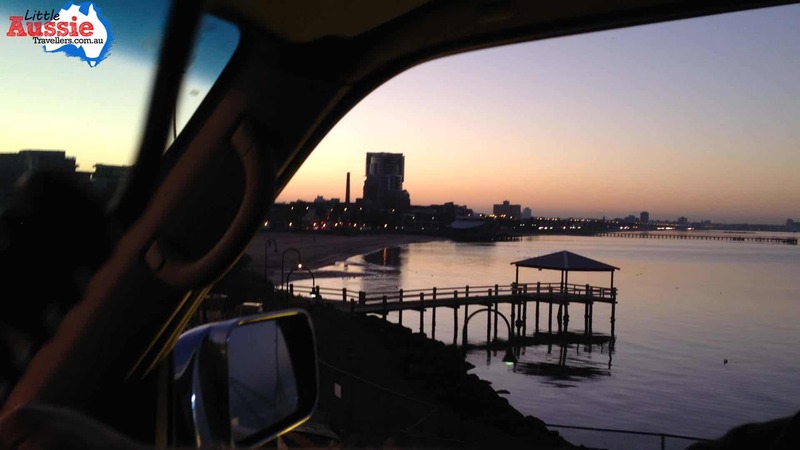 We arrived in the tiny coastal town almost swept away by an on-shore wind beating against the car and the van as we drove, that brought with it dark clouds and the threat of heavy rain. Yet, Stanley shone it’s beauty as if the sun were glowing golden. As with any new place, we had no idea what to expect, and my expectations and positivity had slightly plummeted in the early afternoon. “It’s a crap road” she told us, explaining that the road between Ulverstone and Stanley was one of the worst in the state. “Great” my expectations of a scenic afternoon drive plummeted and I braced myself for a horrific drive along the horrible road we had to face, before saying a sad goodby to Yoshi. There’s always a sense of heaviness when we leave our canine mate at a boarding kennel for the night. He knows what’s coming and immediately tugs at his leash in the opposite direction of the kennel, causing an instant sense of guilt. That added to the warning we’d been given about our afternoon road trip left me a bit edgy. We’d had a giggle during the day about being “Mainlanders”, a title we’d fast realised we’d be branded with as visitors to the island state. 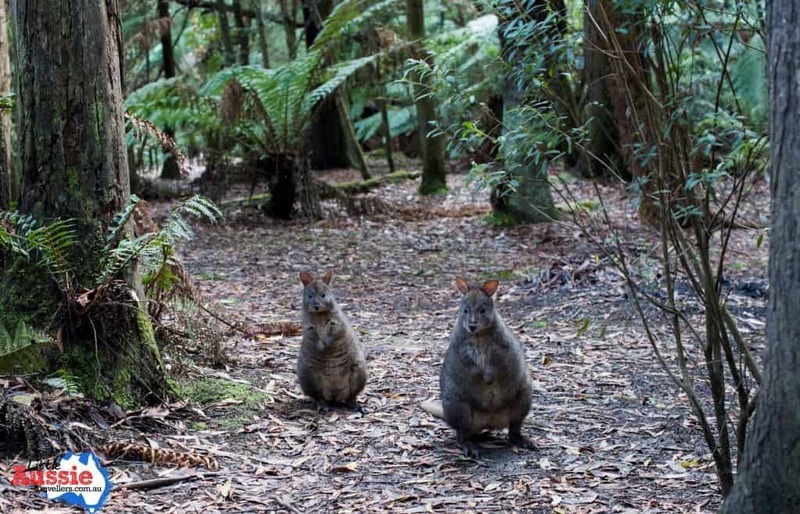 Locals had shared a friendly jest about our expectations compared to those who lived in Tassie, and the way visitors saw things from a mainland perspective. The expectation of road quality turned out to be one of those differences. 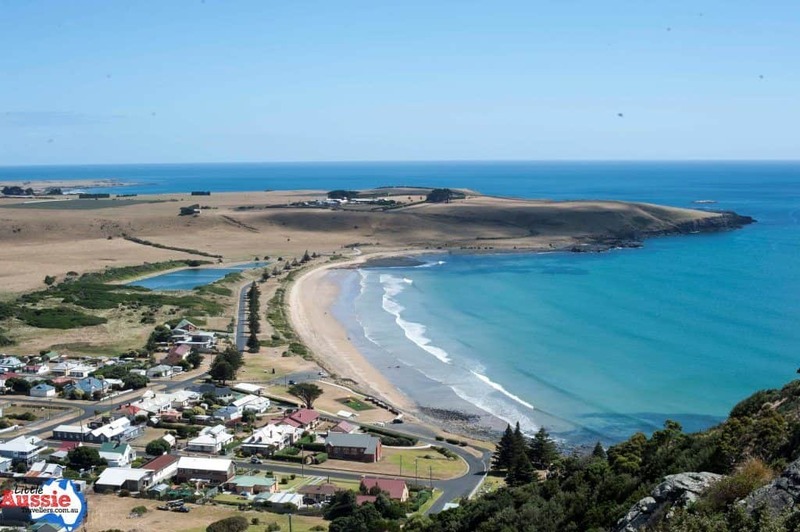 Compared to many roads we’ve explored in our Australian travels, the road to Stanley is an easy drive and in good condition, with views that are definitely competition for the Great Ocean Road in Victoria. Stanley greeted us with its most popular landmark; “The Nut”. The distinctive landmark is high on the must-see list when you’re visiting Tasmania. 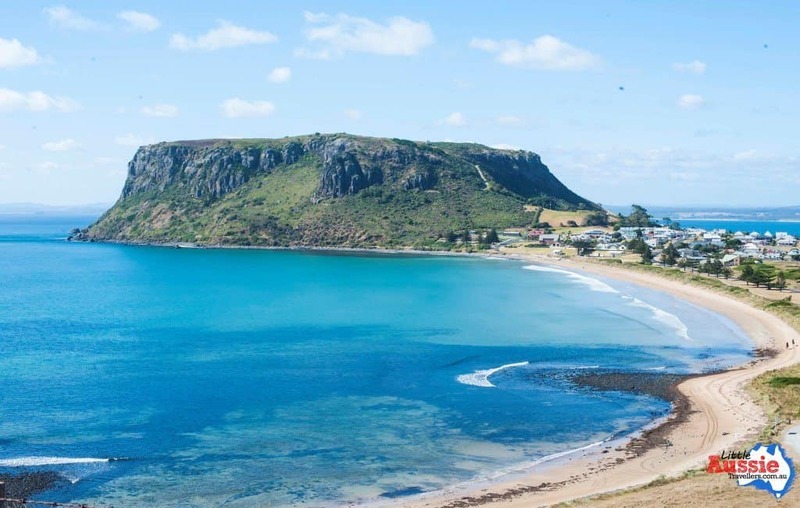 The Nut is a volcanic plug, originally discovered by explorers Bass and Flinders in 1798, who at the time, named it Circular Head. Today, it dares visitors to climb it from top to bottom before undertaking the 2 kilometre walk at the top, where you’ll be rewarded with far reaching views of the turquoise waters surrounding Stanley. While The Nut is definitely a defining feature of this beautiful little town, a strong sense of history is present as you wander the streets. Both historical stories of the fishing industry that still supports the town today, and streets lined with beautifully maintained buildings and cottages that greet you while you undertake the historical walk through the town. For something special, add in a trip to the historic Highfield House. As if the beauty and history of Stanley wasn’t enough, here, you’ll experience an amazing night-life, although perhaps not the kind you’re used to. 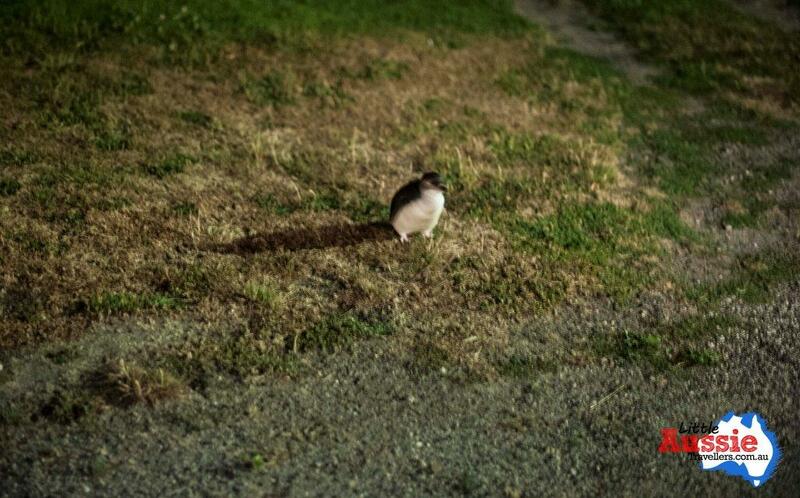 Once the sun sets, the Stanley coastline comes to life with penguins coming back into shore. We waited in the cold on-shore winds for quite a while before being rewarded with the beautiful sight of these small waddling birds. For another wonderful after dark experience, the wharf provides lots of fun for the kids to do some squidding. With the beautiful fresh seafood for sale in town, even if you don’t have much luck catching your own, you can still be assured of tasting some of the freshest Tasmanian seafood available here. Stanley is a small town, and yet it has so much to offer those willing to explore it’s history, and natural wonders. 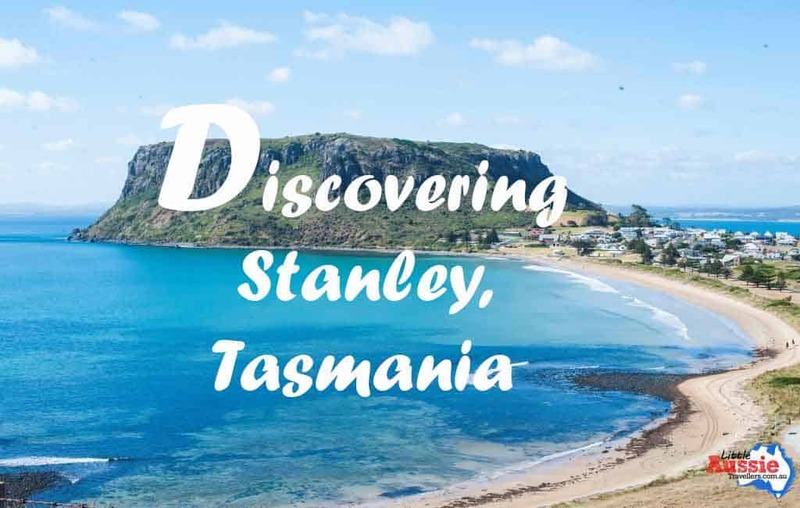 Don’t miss this gorgeous little village on your trip to Tassie, you could spend a day or a month and I still don’t think Stanley would lost its charm.